War photographers have a thankless job to be sure. Gaining entry into some of the most dangerous parts of the world armed only with a camera and their intuition they experience life on the raw edge. They have that rare position as an impartial spectator, neither unlucky civilian caught in the cross the fire nor rebel, nor soldier armed to the teeth, the war photographer is a rare breed. Is it narcissism, to enter such a world for own your kicks? To advance your career and win a Pulitzer Prize, to make money at the expense of man taking his last breath, or a rotting corpse stuck to the roadside? Is it the ultimate sacrifice to brave an interminable amount of pain and suffering to deliver a message to the outside world, let them know what a war is really about – and see if they can stand it? This weekend I watched the documentary ‘McCullin’ about British war photographer Don McCullin. Growing up in blitz devastated London in the 40’s and 50’s McCullin was born into a landscape ravaged by war, and he began by taking photographs of gangs and slums, the impoverished and hard working. After successfully selling a few photographs of gang members he had grown up with to the Observer McCullin went to Berlin to watch the wall go up, and then on to Biafra, Vietnam, and Northern Ireland. His photographs capture the essence of all it was to be at war in the late twentieth century. The shell-shocked soldier in Vietnam, who looks as if he has his eyes fixed permanently on a horror he cannot forget. 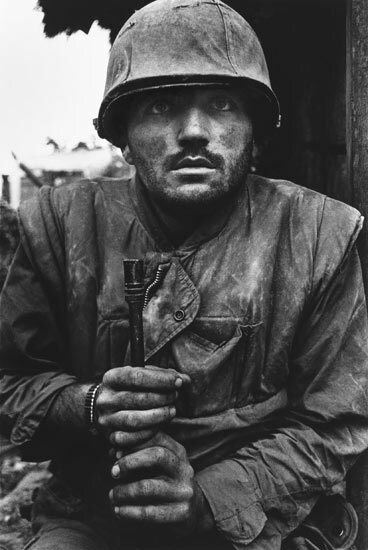 McCullin said the soldier never moved, or even blinked, while he was taking the photograph. It has been observed that in Vietnam almost none of the most well known photographs were posed – a poignant fact from a televised war. 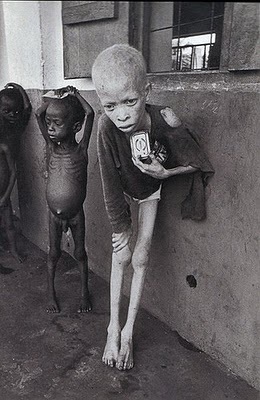 It wasn’t the corpses or smashed in faces that affected me most while watching this documentary, but brief footage of some kwashiorkor bloated bellied, toothpick legged children of Biafra struggling to climb a single step. The kids were naked, anonymous, just hours from dying in the dust – and it was painful to watch. When there are so many it is difficult to remember one individual, but Don McCullin spoke of one albino child who approached him out of the crowd and tried to hold his hand. Biafra brings me on to my next point – following the theme this weekend I also watched ‘The Bang Bang Club’. This film is based on the true story of several young photographers in South Africa who captured images of violent clashes between the ANC and IFP in the early 1990’s. Amongst them was Kevin Carter, the first photographer to capture the gruesome execution method of ‘necklacing’ whereby a tire is placed around the victim’s neck and set alight. 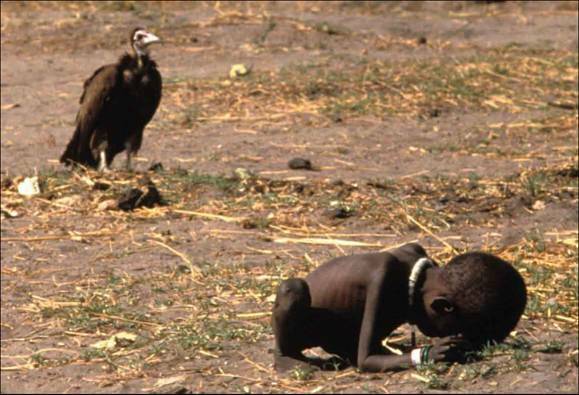 However, it is Carter’s 1994 Pulitzer Prize winning photograph of a little girl dying in the Sudan while a vulture looks on that really caught my attention. I first became aware of this photograph in a round about way while reading Mark Z. Danieleweski’s ‘House of Leaves’. One of the main characters is a photographer based on Carter who took a ‘similar’ photograph of a dying girl. In the book, the character is haunted by thoughts of the little girl he did nothing to help and when he becomes lost in his labyrinthine house it is not the Minotaur, but the girl who stalks his uneasy mind. In real life Kevin Carter too was stalked by his subject. He was unable to answer questions about what happened to the girl, although he later claimed to have picked her up and carried her to a feeding station. It’s possible to argue that there were two vultures present – the one in the photograph, and the one behind the lens. In the moments that Carter was photographing death, could he have been doing something to prevent it? Or was exposing this scene to the world enough? Undoubtedly the weight of this debate contributed to Carter’s suicide in 1994. Don McCullin also mentioned being criticized for merely profiting from the pain of others, although he attests that he did help of course – as any human being would have. Moving around from atrocity to atrocity must surely take its toll though. Like that story of a girl little girl walking a long a beach covered in hundreds of starfish and throwing them back into the sea one at time – it’s impossible to save them all. Don McCullin comes across as a very calm, measured and somber person on film and I’m inclined to think this is a temperament either developed as a result of exposure to war, or else well equipped to deal with it. Nevertheless he openly states that he was a ‘war junkie’, chasing the immediacy of life and that it eventually wrecked his marriage. In ‘The Bang Bang Club’ the photographers are constantly drinking, smoking, chasing girls, attempting to make the most of every precious second of life, and blot out the atrocities of the day. The photographers chased ‘bang bang’ until it took away everything they had. 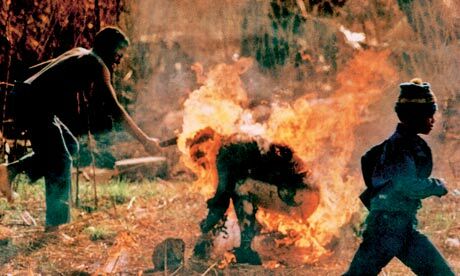 Ken Oosterbroek was killed in Thokoza township fighting in 1994, Greg Marinovich was received a gunshot wound in the same clash and has since been shot several more times, Joao Silva lost both legs below the knee in Afghanistan in 2010 – and Kevin Carter never made it that far. Whatever fame or glory a war photographer receives, he certainly pays his dues – one way or another. Labyrinths. There’s something about labyrinths that I find endlessly (no pun intended) fascinating. I think it must the element of danger or the excitement of the unknown. Something beautiful, intricate, deadly – always alluring and yet sure to hold something nasty. Maybe when you think of labyrinths you are transported first to ancient Greece. On the island of Crete King Minos would periodically chose seven boys and seven girls to be sent into his labyrinth. Inside they would be hunted and eaten by ‘Asterion’ – the Minotaur, a mythical creature with the body of a man and the head of a bull. So the legend goes, when the third sacrifice approached Theseus volunteered to slay the monster. Ariadne, the daughter of King Minos fell madly in love with Theseus and offered him a ball of thread to help him to find his way out of the labyrinth. Theseus successfully killed the Minotaur and was able to lead the surviving youths out of the labyrinth with the help of Ariadne’s thread. Skipping forward to more modern times the labyrinth has proved popular fodder for creative types. Mexican director Guillermo del Toro’s 2006 film Pan’s Labyrinth explores the idea of a mythical labyrinth as imagined by a little girl named Ofelia. Despite appearances Pan’s Labyrinth is not really a suitable film for young children, the real life drama will give you nightmares if the mythical monsters don’t do the trick. Ofelia is going through some tough times. The story is set in Spain in 1944, and Ofelia and her pregnant mother have come to live with Captain Vidal who is to be Ofelia’s new father. It’s post civil war era and Captain Vidal is busy rooting out anti-Franco rebels and being generally unpleasant. Ofelia finds a labyrinth in the woods nearby, and it here that she meets a faun who recognises her as the long lost Princess Moanna. As things become more difficult at home, her mother is ill and Vidal reveals himself be bloodthirsty in his pursuit of the rebels; Ofelia increasingly escapes into the world of the faun, completing a number of tasks for him. When everything really begins to fall apart at the end Ofelia runs into the woods and is drawn back to the labyrinth. Only trying to help . . . honest! Ofelia’s labyrinth is very much one that is linked to her emotions and her mind; a psychological retreat. I’m never quite sure what to make of the faun, as at times he is creepy and cold and although he ultimately helps Ofelia I wouldn’t exactly describe him as a benign influence. Interestingly enough the word ‘pan’ comes from the Greek meaning ‘all’ – like the all encompassing nature of the labyrinth perhaps? Pan was the Greek god of the wild, and in Roman mythology appeared as a faun. If you haven’t seen Pan’s Labyrinth then it’s definitely worth a look as it’s an incredibly beautiful piece of cinematography and actually deals with some very difficult themes. (I also highly recommend The Orphanage, 2007, which del Toro worked on as executive producer). I’m a long time fan of Neil Gaiman’s Death and Sandman, and they’re probably amongst a small pile of books that I’d describe as ‘comfort reading’. Easily my favourite out of the lot is the seventh book in the series; Brief Lives. Brooding and miserable after being ditched by his girlfriend, Dream is drawn into Delirium’s hunt for their missing brother Destruction while harbouring his own ulterior motives. After a series of mishaps and arguments Delirium and Dream eventually decide to consult their brother Destiny for help in finding their missing sibling. They decide to walk to the garden of Destiny, and there’s only one way there: through a labyrinth. As Dream and Delirium walk through the labyrinth it twists and changes until they finally emerge into the Garden of Destiny. It is interesting that this should be the route to Destiny and is a thoughtful reflection on the course of our lives. No matter what paths we take are we always ‘destined’ to end up at the same place? Are all paths really the same path? I have mixed thoughts on the concept of ‘destiny’ or ‘fate’ so my answer to this is that I just don’t know. The indisputable beginning of my obsession with labyrinths was Mark Z. Danielewski’s House of Leaves, one of my all time favourite books. This book is quite long and complex so I’m only going to give a very abbreviated summary. An average American family moves into an average American house in what is supposed to be a dream move to the country. Shortly after moving in the family discover that the house is larger on the inside than on the outside, something which the father – Will Navidson is determined to get to the bottom of. One day a doorway appears in the living room, the doorway leads into a cold dark corridor that seems to extend impossibly beyond the dimensions of the house. Navidson is eventually moved to assemble a team of professional explorers to plumb the depths of the labyrinth he has discovered. The story has several different narrators, each calling into question the accuracy of the next. The entire book is a semioticians dream – if you’re into that sort thing. And if not, well it’s still pretty addictive. The house is often linked to the mental state of those exploring it. If they are frightened or lost then it expands, if they are sure of the way then they paths become shorter and easier to navigate. All those who come into contact with the house are moved to explore the depths and pathways of own their mind, forcing them to reflect on the things that have shaped them and the things that are important. After waiting in the bar for a while I was blindfolded and taken to the entrance of labyrinth. Once there I deposited my gold coin in the the door and entered. Although I’d heard people talking about this place and I couldn’t pass up the opportunity to explore a real labyrinth I have to say I was a little bit nervous – anything could have been inside. What I actually discovered was a womb or heart like chamber with a number of ‘corridors’ leading off it. Some of the corridors became crawlspaces, some were dead ends, and when I finally did want to leave pretty much all of them seemed to lead back to the same place! The most terrifying part was a door that lead into a completely pitch black brick corridor. However old you are there is always something terrifying about being unexpectedly alone in the pitch black in an unfamiliar place, and I could hear my heart beating. As I felt my way along the corridor a bright light would flash every few seconds, and I am now reminded of Ernesto Sabato’s words, ‘My mind is dark as a labyrinth. Sometimes there are flashes, like lightening, that illuminate some of the passageways . . .‘ When I finally did find the exit and was talking to my friend afterwards he suggested that it wasn’t scary in there unless you made it that way – what you find in there is yourself.